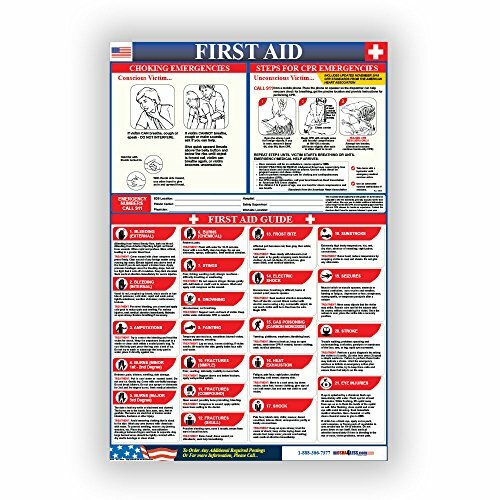 Brady PS128E 18" Height, 24" Width, Laminated Paper, Black, Red, Blue On White Color Prinzing First Aid Training Poster, Legend "Emergency First Aid Guide"
Brady PS128E/45854 prinzing first aid training poster, plexi-glass holder available. Size is 18" height 24" width. Legend is "EMERGENCY FIRST AID GUIDE (etc. )", color is black, red, blue on white, , material is laminated paper. 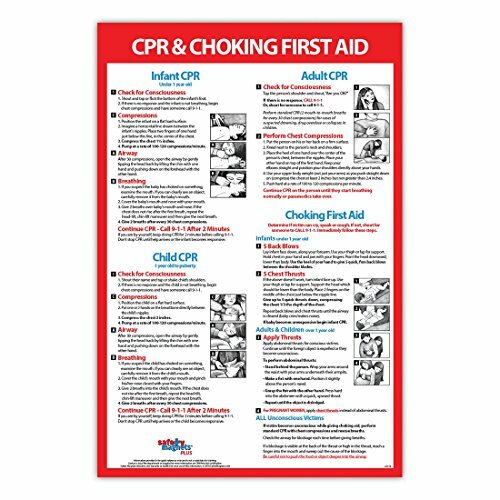 CPR & Choking First Aid Instructions Poster - Infant, Child, and Adult - Laminated - 12 x 18 in. 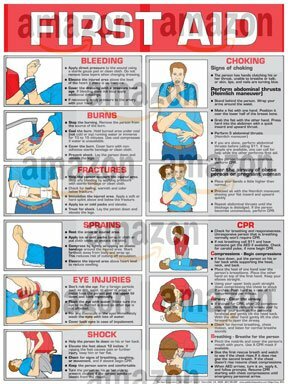 When emergency strikes, your workplace can be prepared with this life-saving CPR & Choking First Aid Poster. 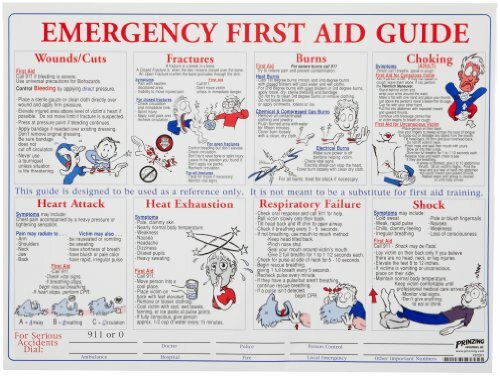 The easy to understand poster features first aid instructions for infants, children, and adults. 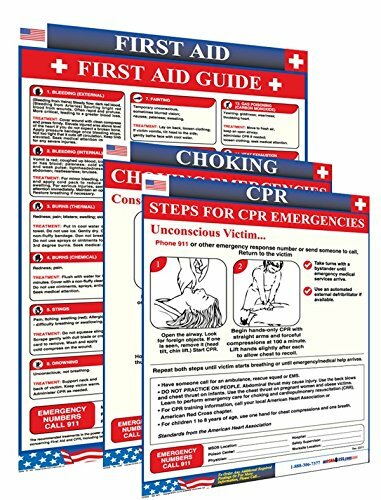 Helpful illustrations of the Heimlich Maneuver and CPR technique are included. Laminated. Measures 12 x 18 inches. Made in the USA. Provide peace of mind and a safer environment for your restaurant, school, daycare center, or office. When emergency strikes, your workplace can be prepared with this life-saving Choking First Aid Poster. 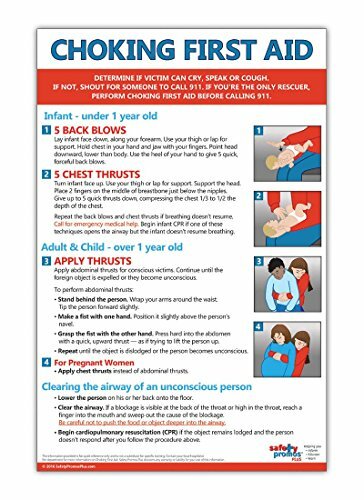 The easy to understand poster features helpful illustrations of the Heimlich Maneuver and first aid instructions for infants, children, and adults. 100# cover gloss paper. Laminated with 3 mil thick laminate with edge protected corners to ensure durability. Measures 12 x 18 inches. Made in the USA. Provide peace of mind and a safer environment for your restaurant, school, daycare center, or office. The First Aid Safety Poster is an amazingly helpful all in one guide in case of an emergency. Clearly, and beautifully, shown are detailed illustrations and the exact information needed for bleeding, burns, fractures, sprains, eye injuries, shock, CPR, and choking. Accidents can occur at any moment and this poster will help any business be prepared for the most commonly occurring injuries. Includes new 2015 AHA standards. 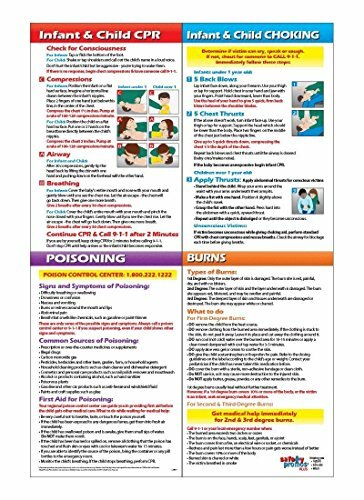 When emergency strikes, be prepared with this life-saving CPR, Choking, Poisoning, and Burn First Aid Poster for infants and children. The easy to understand instructions feature helpful illustrations of the Heimlich Maneuver and CPR technique, the symptoms of common household poisonings, and instructions for treating burns. The non-laminated poster measures 12 x 18 inches. Made in the USA. Put safety first with this emergency preparedness essential. Give yourself peace of mind and a safer environment for the children in your home, school, or daycare center. Manufactured using 100 pound cover gloss paper. Features easy-to-read, stylistic Sans-Serif font and crisp graphics. Would you like a laminated version of this poster? Enter B074RM93GQ in your Amazon search box for a laminated option. 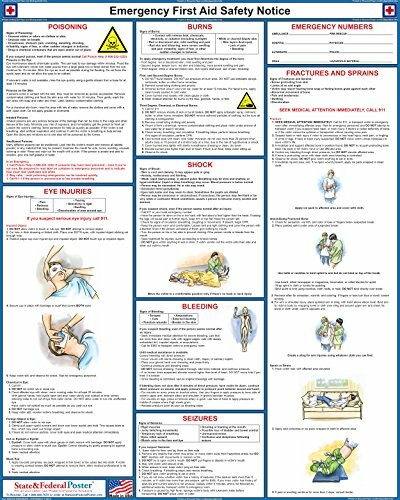 First Aid Poster - Laminated 24" x 30"
Symptoms; treatment; and tips for wide range of medical emergencies. Great for home use or the professional as a quick reference or refresher. Employers must ensure ready availability of medical personnel for advice and consultation on matters of health. 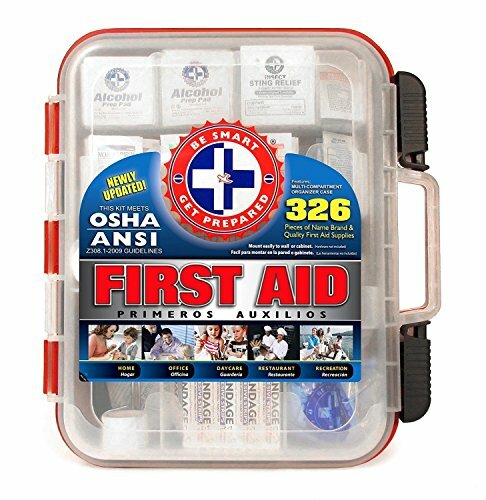 OSHA Standard 1910.151(b) states: "In the absence of an infirmary, clinic, or hospital in near proximity to the workplace which is used for the treatment of all injured employees, a person or persons shall be adequately trained to render first aid. Adequate first aid supplies shall be readily available." Help prevent accidents and liability issues with this FIRST AID poster. Assist in OSHA standards. 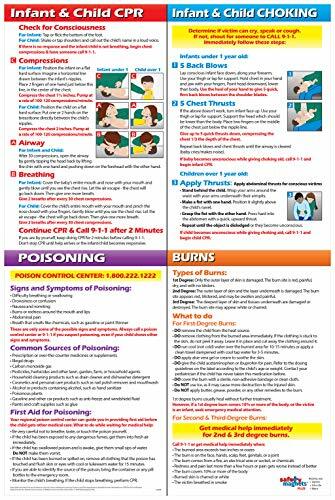 When emergency strikes, be prepared with this life-saving CPR, Choking, Poisoning, and Burn First Aid Poster for infants and children. The easy to understand instructions feature helpful illustrations of the Heimlich Maneuver and CPR technique, the symptoms of common household poisonings, and instructions for treating burns. The laminated poster measures 12 x 18 inches. Made in the USA. Give yourself peace of mind and a safer environment for the children in your home, school, or daycare center. Would you like this poster Non-Laminated? Enter B074RLZYTT in your Amazon search box. Find Online Coupons for NAME from Every Store at Warehously Comparison Shopping Website. Shop Now For Awesome NAME with Free Delivery to USA, UK, Canada, Europe, and Australia at Warehously.com Store. Online Shop Warehously Offers Also Brocade Coffee, Solid Wood Framed Picture and Panasonic Car Speakers - Shop Now For Sale Prices.